iPhone X, iPhone XS Cover and Lens Adapter 37mm / 52mm / 58mm threaded Lenses : allputer.com - Accessories for all your Portable Electronics & Computers! This Smart Phone SLR mount allows photography nuts to mount their SLR camera lenses. The SLR mount snaps directly over the camera lens and comes in configurations that allow SLR lenses to attach. While this product might not be all the rage among everyday users, we’re sure it will be a fun accessory for photography fanatics. 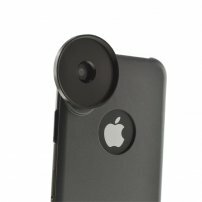 - Want to know if this amazing lens will fit with your device? Just type the model in the search box or feel free to contact us. We will be happy to assist you. - To have better compatibility, you may buy our Cover + Adapter + 37mm lens in SET, the compatibility with other 37mm lenses are not guaranteed.